Crewmembers at the Santa Clara Abel Santamaría International Airport in Cuba welcome JetBlue flight 387 on Wednesday, August 31, 2016, the first commercial flight to Cuba from the U.S. in more than 50 years. NEW YORK--(BUSINESS WIRE)--JetBlue (NASDAQ:JBLU) today announced the historic launch of service to Havana’s José Martí International Airport (HAV) from three of the airline’s focus cities, with the first flight taking off this morning shortly after 9 a.m. from New York’s John F. Kennedy International Airport (JFK). JetBlue’s service to Havana from Orlando begins November 29 and service from Fort Lauderdale-Hollywood begins November 30. 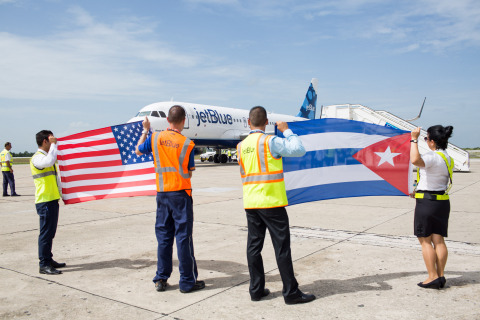 JetBlue flight 243 became the first commercial flight to Cuba from the New York area since scheduled service resumed this year and marked the first day of U.S. commercial service to the Cuban Capital in more than 50 years. The New York metropolitan area is home to the second-largest Cuban-American population in the U.S.
“This inaugural flight between New York and Havana is a milestone in this new era of progress between our two nations, and another tangible result of this state's successful trade mission to Cuba,” said New York Governor Andrew Cuomo. “I congratulate JetBlue on this landmark accomplishment, which will help further ties and strengthen the economic relationship between New York and Cuba." "Today's inaugural regular JetBlue flight between John F. Kennedy International Airport and Havana results from Governor Cuomo's pioneering State visit to Cuba in April 2015 and represents another historic aviation milestone for the region that will further increase commerce and benefit travelers,'' said Port Authority Executive Director Pat Foye. "I am proud the Port Authority and JFK Airport are involved in this significant step forward in helping to reestablish direct travel between the U.S. and Cuba." The launch of Havana service also marks a major milestone for JetBlue as the Cuban capital becomes the airline’s 100th destination in 22 countries. Less than 17 years since its first flight, JetBlue, known for offering an award-winning experience at a competitive price, now serves an exciting and diverse range of destinations throughout the U.S., Caribbean and Latin America. JetBlue now serves four destinations in Cuba. With its inaugural flight to Santa Clara in August, JetBlue became the first U.S. carrier to operate commercial flights between the U.S. and Cuba in more than 50 years. Earlier this month JetBlue began serving the cities of Camagüey and Holguín. “We commend the work of both U.S. and Cuban officials for making today possible. We also commend the Cuban Ministry of Transportation, IACC, and the Havana Airport for entrusting us to operate this route and look forward to our long-term partnership as we continue to grow our presence in Cuba,” said JetBlue President & CEO Hayes. New York flights will be followed later this week by JetBlue’s first nonstop flights between Orlando International Airport (MCO) and Havana on Tuesday, November 29, as well as new nonstop service between Fort Lauderdale-Hollywood International Airport (FLL) and Havana on Wednesday, November 30. A second nonstop between Fort Lauderdale-Hollywood and Havana will begin Thursday, December 1 and operate daily except Saturdays. "Opening the doors of cultural and economic opportunity are key benefits of air travel," says Frank Kruppenbacher, Chairman of the Greater Orlando Aviation Authority. "JetBlue's direct service to Cuba from Orlando provides our passengers and community with a unique opportunity to build lasting bonds between our two cultures." "Fort Lauderdale-Hollywood International Airport is honored to host JetBlue's inaugural flight to Havana from our airport," said Mark Gale, CEO/Director of Aviation. "This historic flight will open the way for affordable and convenient travel for Cuban-Americans to visit family on the island and for all Americans to experience the culture and people of the Cuban capital." JetBlue’s Cuba service in the Sunshine State provides convenient nonstop service to communities throughout south and central Florida. And with nearly 30 nonstop destinations in Orlando and more than 50 nonstop destinations in Fort Lauderdale-Hollywood, JetBlue customers across the airline’s network can take advantage of convenient connections to and from Cuba by traveling through JetBlue’s Florida focus cities. Affordable fares: JetBlue offers a low starting fare to make Cuba more accessible to those visiting family members or traveling to Cuba for cultural, business or group travel. Health insurance included: JetBlue includes Cuban government-required health insurance coverage for all travelers on all Cuba-bound flights so that customers do not have to worry about obtaining the insurance separately. Affidavit in a few clicks: Under U.S. regulations, every customer traveling to Cuba must complete an affidavit affirming the customer is going for one of 12 reasons of approved travel from the U.S. Department of Treasury. JetBlue has built the completion of the affidavit right into the booking process so it can be finished in only a couple of clicks. Day-of-travel Cuban Tourist Visa (Tourist Card): Separate from the U.S.-regulated 12 categories, Cuba requires visitors to obtain an entrance visa onto the island. For customers who qualify for a Cuban Tourist Visa (Tourist Card), JetBlue will make those available for purchase upon check-in at one of its gateway airports or at the gate for connecting customers on the day of travel. All travelers to Cuba should make their own determination with respect to the appropriate type of visa required by Cuba for their purpose of travel. JetBlue serves Santa Clara, Camagüey, Holguín and Havana from three U.S. gateway cities with multiple flight options for JetBlue customers across the airline’s network. With up to seven daily flights and nearly 50 weekly flights between the U.S. and Cuba, JetBlue is committed to investing in and growing new Cuban markets. JetBlue’s commercial service follows nearly five years of successful charter service operating multiple routes between Cuban markets and U.S. cities. In that time, JetBlue has built strong relationships with airport authorities and worked closely together to make the launch of commercial service possible. Flights between the U.S. and Cuba feature the most legroom in coach (a) and complimentary and unlimited name-brand snacks and soft drinks. Select flights also feature free Fly-Fi, the fastest broadband internet in the sky (b); free, live DIRECTV® programming and 100 channels of SiriusXM® radio in every seatback. (b) Fly-Fi is not available on flights operating outside of the continental U.S. For flights originating outside of the continental U.S., Fly-Fi will be available once the aircraft returns to the coverage area. Fly-Fi is available on most JetBlue-operated flights, with fleet-wide installation complete by the end of 2016. JetBlue is New York's Hometown Airline®, and a leading carrier in Boston, Fort Lauderdale-Hollywood, Los Angeles (Long Beach), Orlando, and San Juan. JetBlue carries more than 35 million customers a year to 100 cities in the U.S., Caribbean, and Latin America with an average of 925 daily flights. For more information please visit jetblue.com. JetBlue today announced the historic launch of service to Havana’s José Martí International Airport from three of the airline’s focus cities.